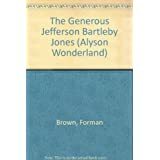 The Generous Jefferson Bartleby Jones (1991) is a delightfully quirky children’s picture book, written by Forman Brown and illustrated by Leslie Trawin. Outrageous rhymes and illustrations work together to communicate the story of Jefferson Bartleby Jones who has an unfortunately lengthy name but a fabulous family. He spends three days of the week living with his dads, and the remaining four days with his mom. Jefferson Bartleby Jones, Jeff for short, talks about how amazing his dads are so much that his friends Chad and Kim start feeling really bad their own dads don’t spend much time with them. But, Jeff is generous and wants his friends to experience the happiness his dads give him so he begins to invite them out on his weekend adventures. One weekend he pairs a friend with each dad and ends up alone. He feels abandoned until all four of them show up to take him for ice cream. he Generous Jefferson Bartleby Jones is a queer celebration of wonderful gay dads that gently reminds all parents to enjoy and make time for their children. Fun Fact: Forman Brown finished writing this book the month he turned NINETY!